length: please select! 26" 27"
From 26-27". Due to the unique multi-layer wood technology, this racket is extremely robust and still belongs to the best hockey rackets in the Senior Hockey Goalie section. The edges and underside of the trowel are additionally reinforced, giving the racket exceptional durability for this price segment. 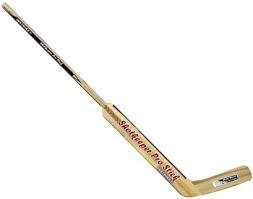 26 to 27 "Goalkeeper Stick The trowel was made from all sizes of multi-laminated wood, making it extremely sturdy. Despite the high stability and vibration-reducing technologies, the racket does not relieve lightness.